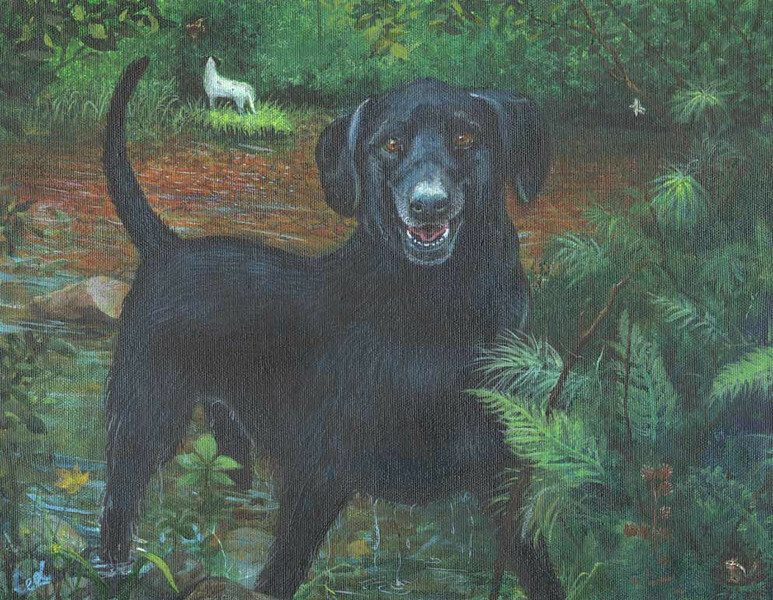 I put the 'Scotchie' English Setter painting on hold until finishing a portrait of our Black Lab 'Brandie'. We lost her to lymphoma two weeks ago. She was just 9 years old and Scotchie's adopted sister. As we took her in for her regular 6 month checkup she was having trouble breathing. Tests showed she had advance lymphoma. After a week of prednisone, and scouring the internet for more holistic choices, she couldn't hold on any longer. I'm giving dog owners the name of another dog lover who faced the same decisions and compiled a book claiming he was able to sustain his companion for over a year with alternate treatments. Note: Brandie's favorite things are in the painting. She loved water, chasing bugs and small critters and she loved her Scotchie.